The US Army had ordered 46 of the A-8B Shrike, but maintenance problems with the liquid-cooled engines of the A-8s led to the new aircraft being powered by Wright R-1820-21 radial air-cooled engines of 500kW, resulting in the new designation A-12 (Model 60). These aircraft retained the open pilot's cockpit with faired headrest which had been introduced on the A-8 production batch, and carried the same machine-gun armament and bombload. In an attempt to improve co-operation between pilot and observer a major modification had been introduced, the rear cockpit being moved forward with its glazed covering forming a continuation of the fuselage decking immediately behind the pilot's cockpit. After long service with the US Army's attack groups the Shrikes were relegated to second-line units in 1939, but nine A-12s still remained in service in Hawaii when Pearl Harbor was attacked in December 1941. The Chinese nationalist government bought 20 of an export version of the A-12 in 1936; these saw some action against the Japanese in 1937-8. There is some resemblance to the Boeing P-26 Peashooter, wheel pants , cowling, tapering of fuselage to epinage, otherwise , two very different airplanes. 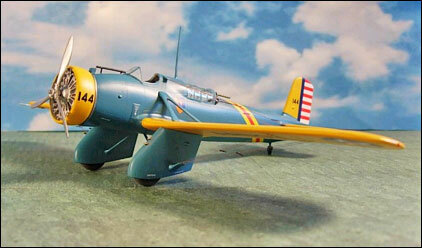 The P-26 is a single-seater as well. Despite it's slight superficial resemblance to the A-12 Shrike the P-26A was not a Curtiss product, it was developed by Boeing. Where do I find the Curtis P26A (Pursuit)?